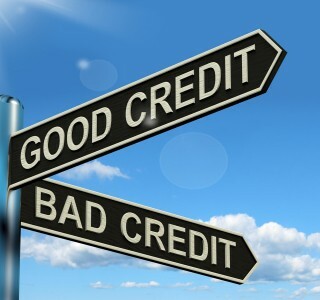 Does Bankruptcy Ruin Credit Scores? 1. Your large debt balances. When you have a large amount of debt your score begins to take a hit quickly. The higher your debt balance compared against your total allowed amount (or credit limit) the worse your credit score gets. Most credit agencies prefer that people keep their balance to 30% or less of their credit limit in order to maintain a good standing. That means that if you have a $10,000 limit, any balance over $3,000 is going to start to chip away at your credit score. Filing for bankruptcy would actually allow you to resolve that debt balance and return to a zero balance. Your credit score would improve quickly as your debt to limit ratio returns to 0% of the credit limit. Poor payment history, missed payments, delinquent accounts or accounts with negative remarks are all marks on your credit history that impact your score. Even missing one payment over 30 days late on a single line of credit can take many points off your score. For bigger lines of credit, like mortgages and student loans, a single late payment can be the difference between a “good” credit standing and a “poor” one. Filing for Dallas bankruptcy would stop a vicious cycle of poor payment history and put you on a path to rewrite your credit history with positive payment notations. Your credit score will see improvement as you continue to keep your balances low, make timely payments on any new lines of credit and keep your accounts in good standing.